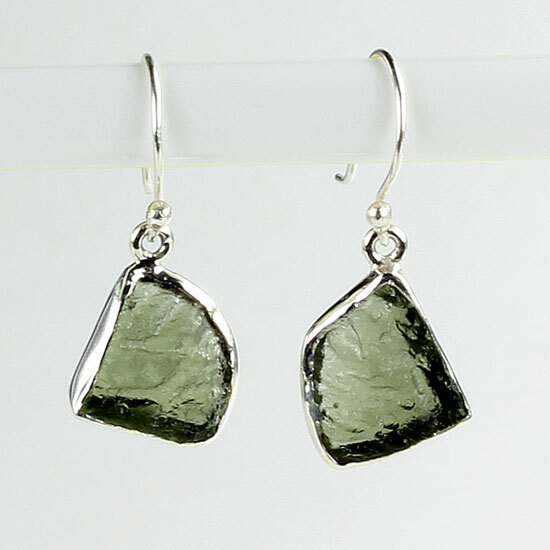 Esprit Creations Natural Moldavite slices in freeform shapes just like an ethereal meteorite. 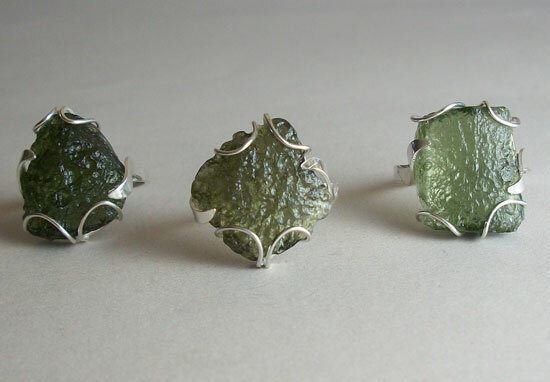 A lady recently bought one of our Moldavite Rings from my customer’s store. She heard about fake Moldavite being passed off as real Moldavite in some places, so she wrote me asking about our Esprit Creations Moldavite. It inspired me to share this interesting information with everyone. Thank you for your inquiry about our Esprit Creations Moldavite. Original Moldavite is a type of Tektite. Tektite means molten, so Moldavite is a combination of melted earth particles, silica and various metal oxides. It is mostly found in the vacinity of the Moldou/Vltava River Valley in the Czech Republic. It was naturally formed about 15 million years ago when a gigantic meteorite comet collided with the Earth in that region. The fiery explosive impact forced Earth particles to shoot out extremely high into space, mixing and melting into parts of the red-hot blazing meteorite. As the particles fell back to Earth, they cooled and solidified in and around the same area in the Czech Republic. That’s why it is said that Moldavite is born from celestial fire. It is the sacred, explosive unity of Sky and Earth. Notice the naturally uneven patterns and texture created by the fusion of sky and earth. We get our Moldavite from a miner who lives in the Czech Republic. There, they call Moldavite “Vltavin” because of the Moldau/Vltava River Valley where it is found. When I get my stones from him, Vltavin is marked on the bags. I only get my Moldavite from this source because then I can guarantee my customers that it is natural. Because Moldavite is a limited resource, good quality natural Moldavite is becoming more difficult to find. As a result, there is imitation moldavite being artificially manufactured in China and Thailand. Because Moldavite has been naturally formed much like glass, through short blasts of intense heat, it is easy to try to imitate. It is being sold in the market as real Moldavite, and it can be difficult to discern. 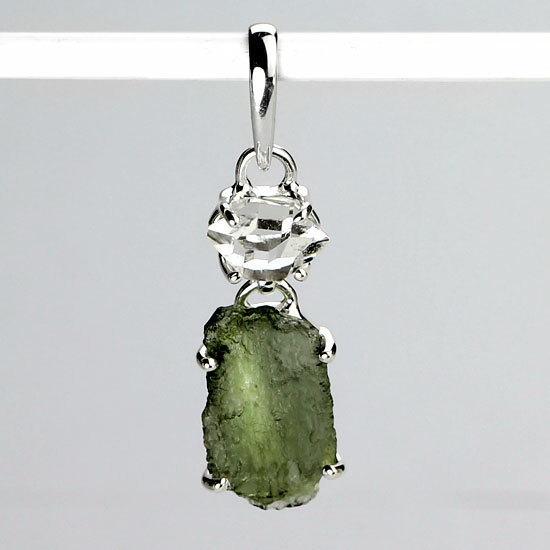 •	Usually imitation Moldavite has a very consistent pattern and matrix, as well as a shiny, glassier look. Each piece of natural Moldavite has very uneven patterns and no two pieces look alike. •	The “bubbly” patterns on fake Moldavite are on the surface, whereas natural Moldavite has bubbles that have been formed inside and are always random sizes. •	Fake moldavite is often a brighter green, whereas natural Moldavite is mostly dark olive green. These are some of the ways how you can tell the difference. It is better to be knowledgeable rather than depending on a certificate, because even some of the certificates are falsely reproduced. A Winning Combination- Natural olive green Moldavite and crystal clear Herkimer Diamond Quartz. Metaphysically, Moldavite is said to encourage inner awareness and aid in reaching constructive goals. Because it was born from an explosion of chaos, yet cooled into a soothing gemstone, it helps to settle disputes or disruptions in our life’s journey. 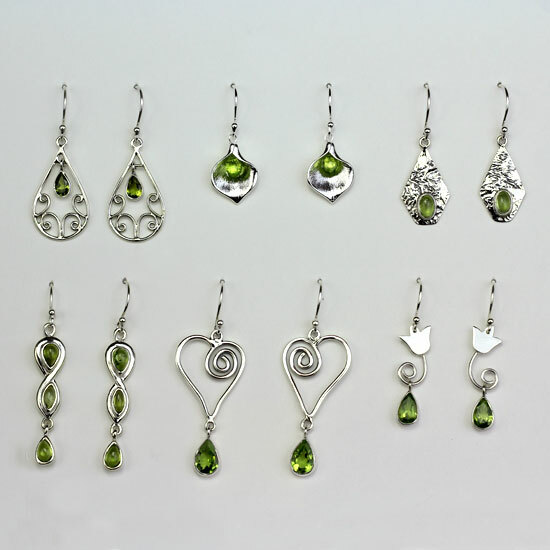 Enjoy your Moldavite piece of jewelry from Esprit Creations. Now when you show it off you have an interesting story to tell your friends! I welcome anyone to e-mail me with questions regarding our stones, designs or jewelry, I am happy to share what I know with you. 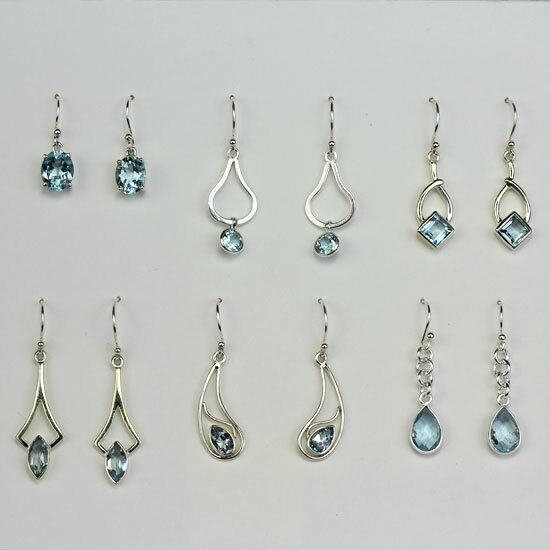 We created a new category, ‘Save Buy Assortments’, to give you a great opportunity to stock up on our popular fast selling earrings at a drastically reduced price. Buying an assortment gives you a value of over $100 for the reduced price of only $70. “Hello Elaine, I am writing you to thank you for my order and the gift! Since this was my first time ordering, I wasn’t quite sure what to expect. Everything is breathtaking! Beyond my expectations! Just stunning! I can’t say enough about your products! I am thrilled I found you! Your new life-time customer.” -Kim, Store Owner, Ca.